An opera singer has been criticised for being "too provocative" for wearing a pro-EU outfit during a performance at the Royal Albert Hall in London on Saturday. 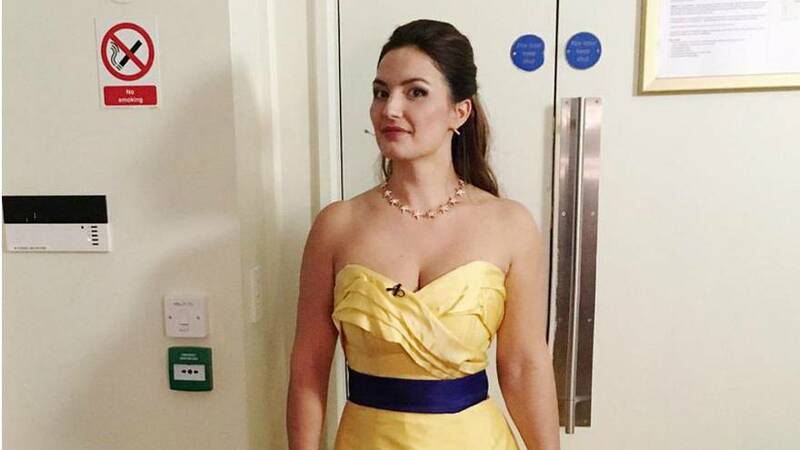 Soprano Anna Patalong posted a picture to Instagram of her criticised attire — a yellow dress adorned with a belt fashioned out of a European Union flag, and a necklace consisting of gold stars. "Rocking some EU colours for tonight's concert," she wrote in the caption. Patalong had also taken part in a march in London earlier in the day, where more than a million protesters demanded a second referendum on Brexit. But, later that evening, Patalong's husband, Benedict Nelson, tweeted that his wife had been asked to change her performance clothes as the colours were "too provocative." "A few yellow stars. How provocative," he wrote. "It's quite right that people's sensibilities were protected from such an overt and provocatively dangerous statement." Nelson also posted video of his wife's performance of Rule Britannia, which was set to the tune of the anthem of the European Union: Beethoven's Ode to Joy. In response, one concert attendee, Angela Whelan, said that while she was also against Brexit, she found Patalong's dress "inappropriate" in its setting. "In my opinion, the public paid to come to a classical music concert and not a politically rally," she tweeted to Nelson. "As much as I applaud your wife for having the guts to quite literally nail her colours to the mast, I feel it was inappropriate to do it at a concert." Appealing to Nelson to not assume the reasons behind the audience complaints, she added, "they may have been Brexiters or Remainers angry that their 3 hours of escapism was hijacked. Who knows..?!" But Nelson maintained that he knew who had complained, and their reasons for doing so. "We don't understand why their views have come above the desires of all the support Anna has been shown from the orchestra, choir and many members of the audience on here and in person," he said. A friend of Patalong, Kitty Whately, also tweeted her support for the singer. "Pretty proud of my mate, Anna Patalong, frankly, and appalled at the demands for her to wear something else," she wrote. "Not ok - 'End of!' (to borrow a phrase from the Brexiters)." Euronews has reached out to the Royal Albert Hall for comment.